It's Day 2 on the countdown to the release of the new plates at Artistic Outpost. For my card today - I used the little boy image from the Bluebird Plate, isn't he sweet! I didn't want to add a lot of color to my image so I sparingly used the Watercolor Distress Technique (TJNL) to add color to my image, then pulled in some Brushed Corduroy Distress Ink to age it a bit. 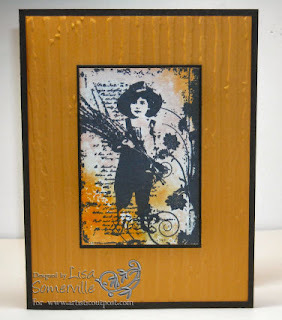 The texture on my back panel is created with my Distressed Stripes Cuttlebug Folder. Just beautiful, a little bit of color goes a long way! Beautiful card and great stamp. I think I have to have that.